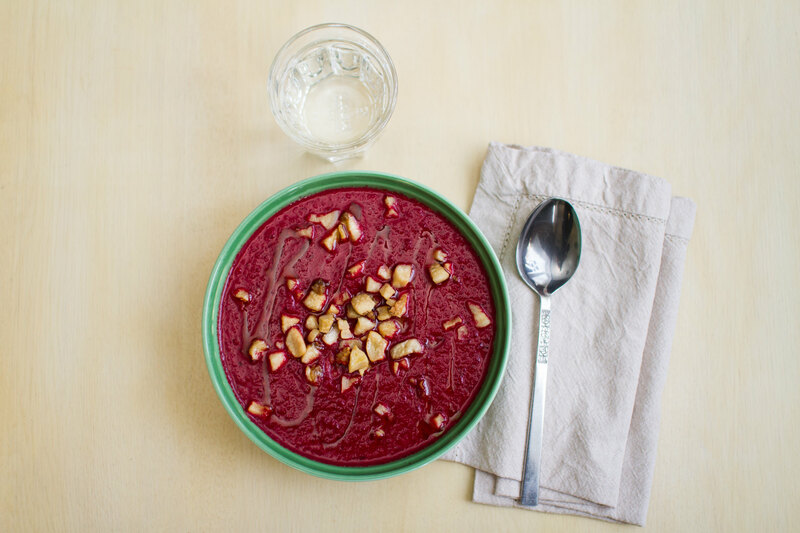 Now you might feel that we have had a bit too much of the pomegranate variations, but we would not agree with that. It is a superb fruit and blending it with different kinds of vegetables can only turn out well! 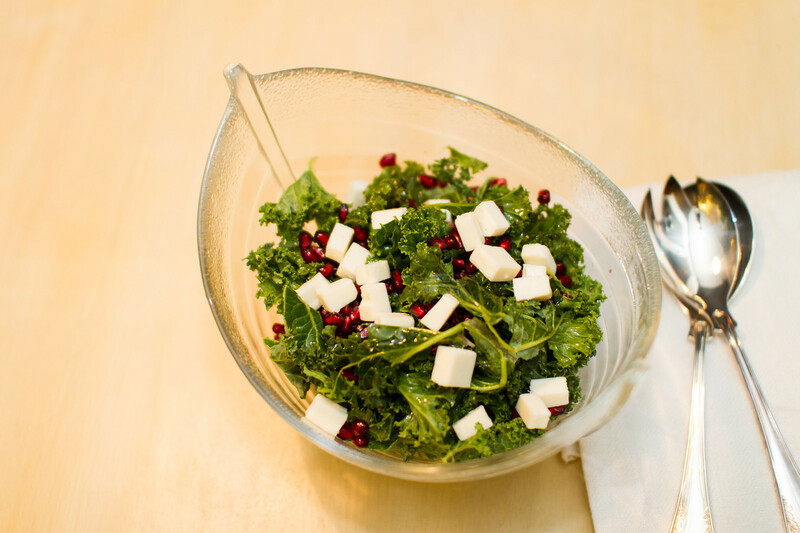 The recipe this time is of a kale and cauliflower salad with pomegranate and feta cheese. A both beautiful and tasty mix. The beautiful ingredients for the salad. Start by separating the haulm and the head from the cauliflower. However, make sure to save the haulm, it is really tasty after being fried, so no need to throw that away. 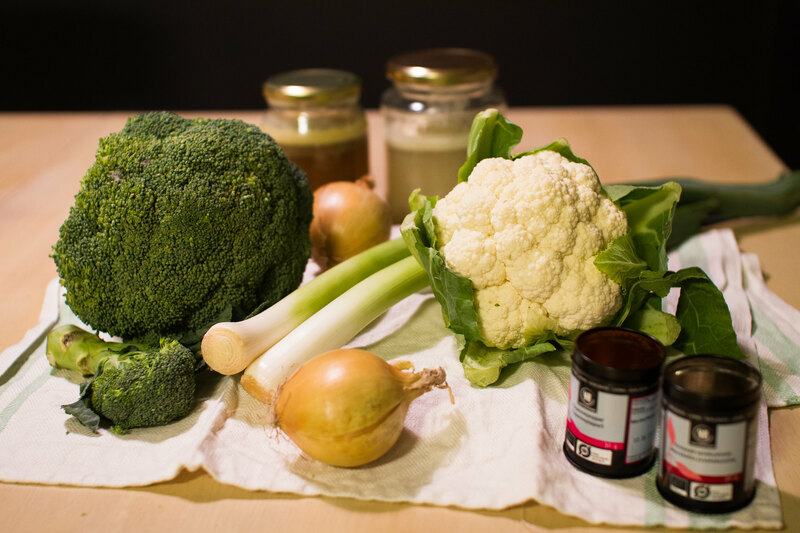 Divide the cauliflower head into smaller bunches and add to an oven ramekin. After seasoning with salt and pepper and topping with coconut oil place it in the oven at just under 200 °C for 40 minutes. Next, chop or rip the kale apart into smaller pieces and put in a bowl. Pick out the seeds from the pomegranate. We made some really nice meat patties to go with the salad. As we have said before we prefer to just form the patties directly from the minced meat rather than adding spices, eggs or other things that supposedly should keep the patties together. In our opinion the patties stick together the best when not mixed with other ingredients. 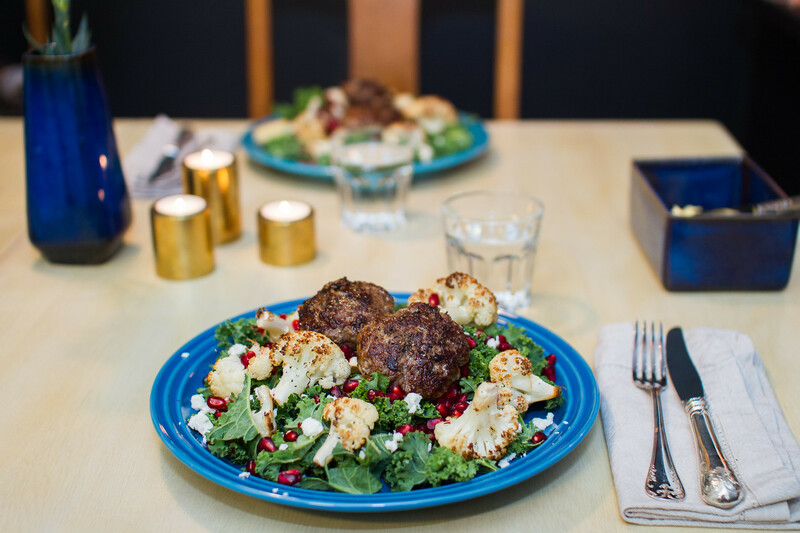 Kale, cauliflower and pomegranate salad with feta cheese and meat patties. 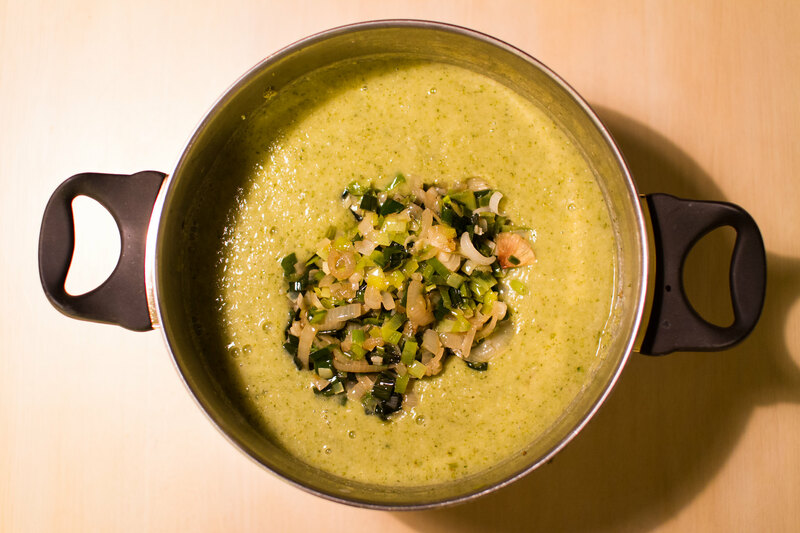 This dish might possibly be something that would be better suited for the summer months rather than the winter. 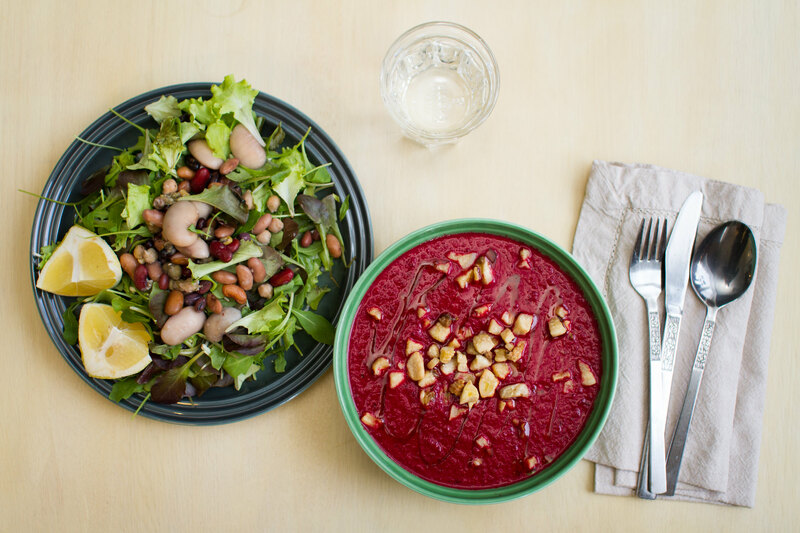 The salad had a really fresh and light feel to it much in contrast to the stews and soups that one associate with winter. 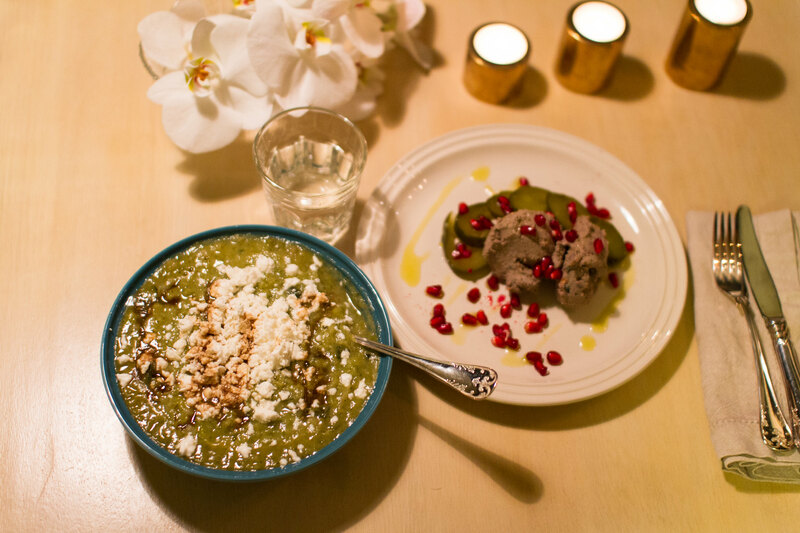 But, there is also never a bad time for good food, so in addition to adding the combination of ingredients to a list of todos for next summer we really enjoyed the dinner, despite the cold outside. We have had something of a renaissance for pomegranate the past few weeks. 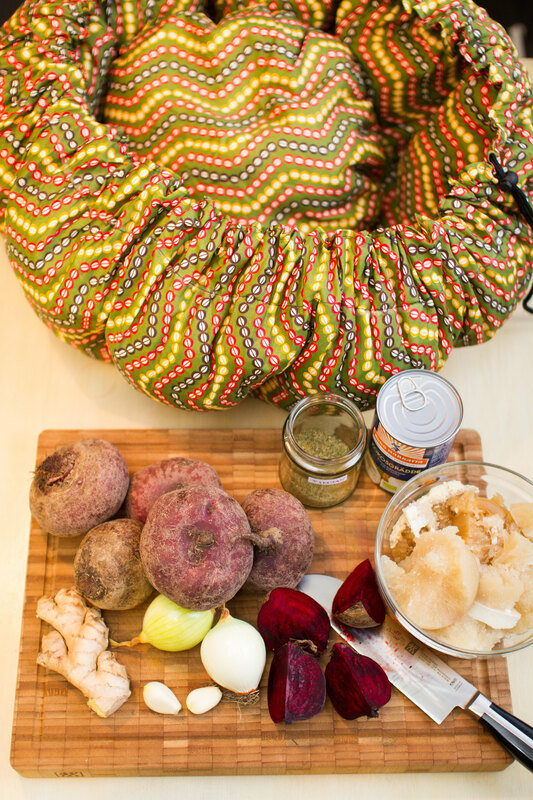 It is really an amazing fruit and it goes really well with many different vegetables and meats. In a previous post we combined it with what is possibly our season favourite, brussel sprouts. 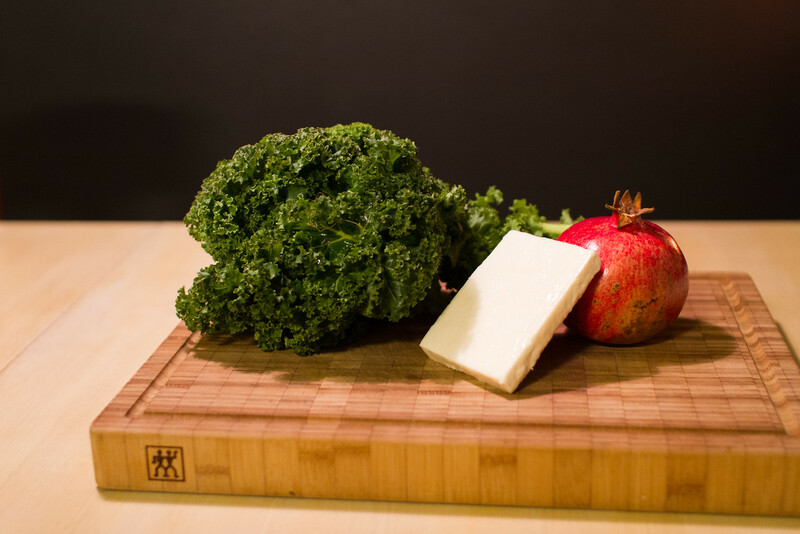 This time we made a nice salad of kale, goat cheese and pomegranate to go with some meat patties. 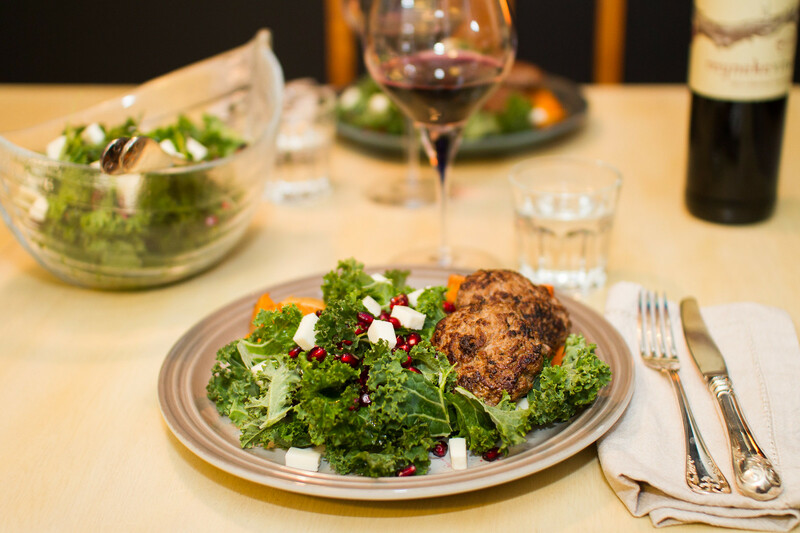 Wonderful dinner with a fresh salad and meat patties. We started with just ripping the kale apart to smaller pieces and then started to pick out the seeds from the pomegranate. 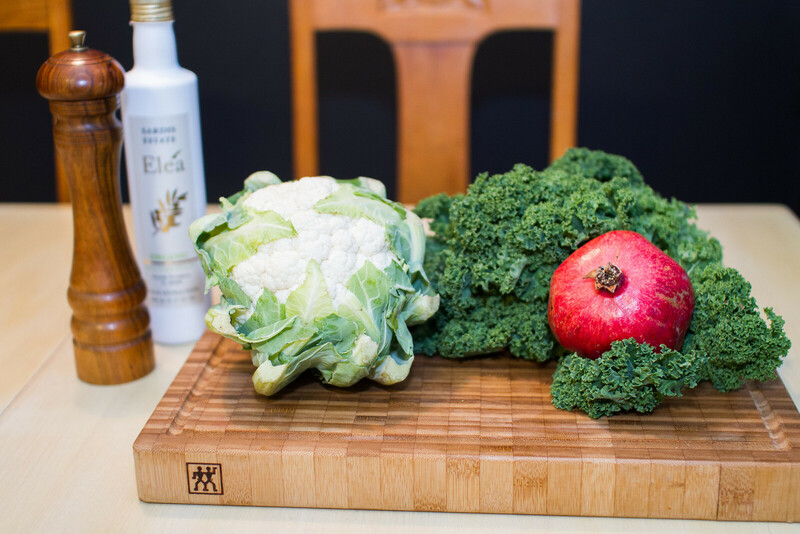 The ingredients for the kale och pomegranate salad. Next we just mixed the three ingredients in a bowl and started to prepare the meat patties. To fill out the meal we also roasted some butternut squash in the oven. For the dinner we topped the dish with a nice olive oil as well as some elderflower vinegar and enjoyed with a glass of red wine. Don’t forget to season with salt and pepper! We had some chicken wings, which I was inspired to make a classic dish out of. 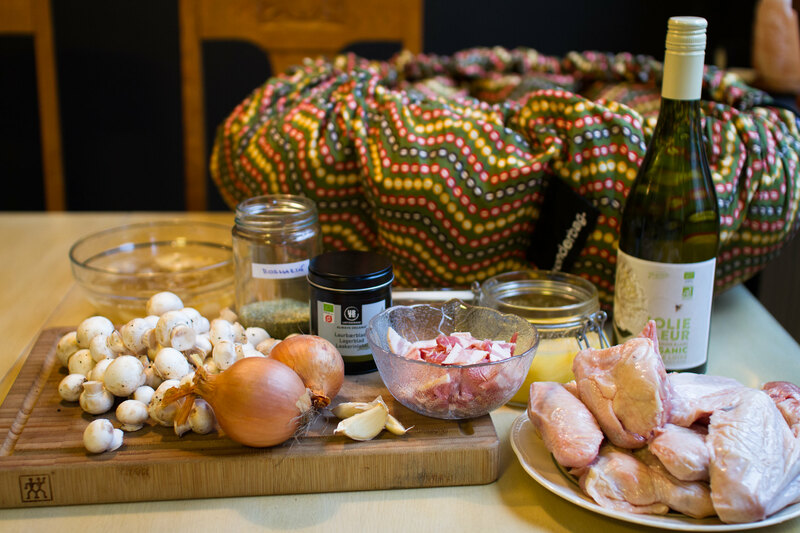 A Coq au vin blanc, but a paleo version of course. It turned out great and the recipe follows below! 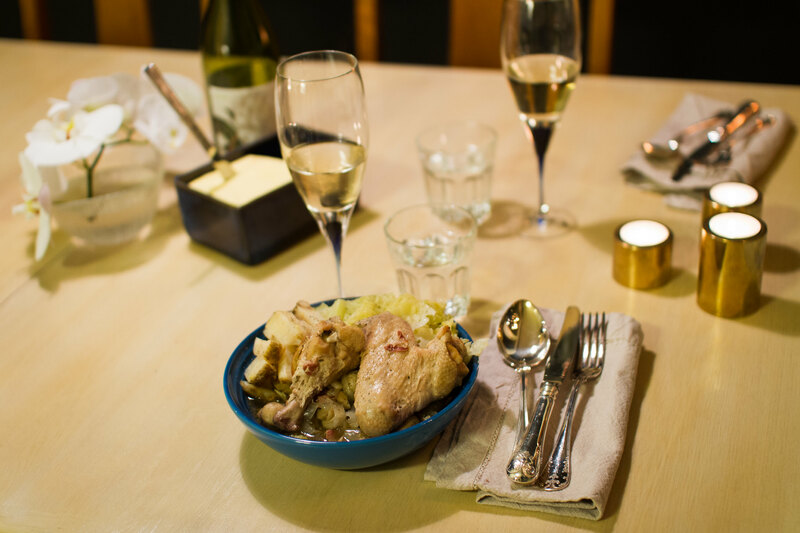 Brown the chicken in a saucepan in ghee, lard or coconut oil. Place them aside for a while. Chop the onion and garlic and cut the bacon in small pieces. Sauté the onion and bacon together with the rosemary. Add the garlic. Place the chicken back in the saucepan and add the bone broth, wine and bay leaves. Fill up with water if needed to cover the chicken. Let it cook for about 20 minutes and add the champignons. If large, chop them first. 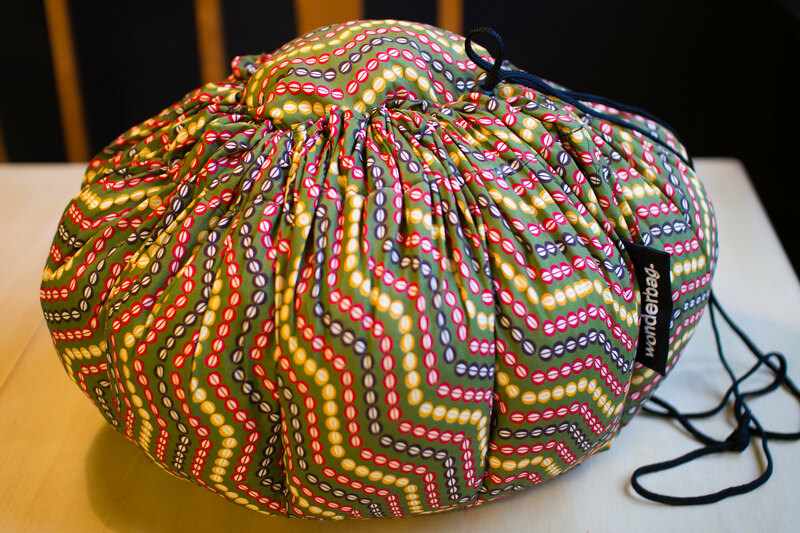 Place the pot in a Wonderbag or leave to simmer on the stove for a couple of hours until the chicken meat loosens from the bone. 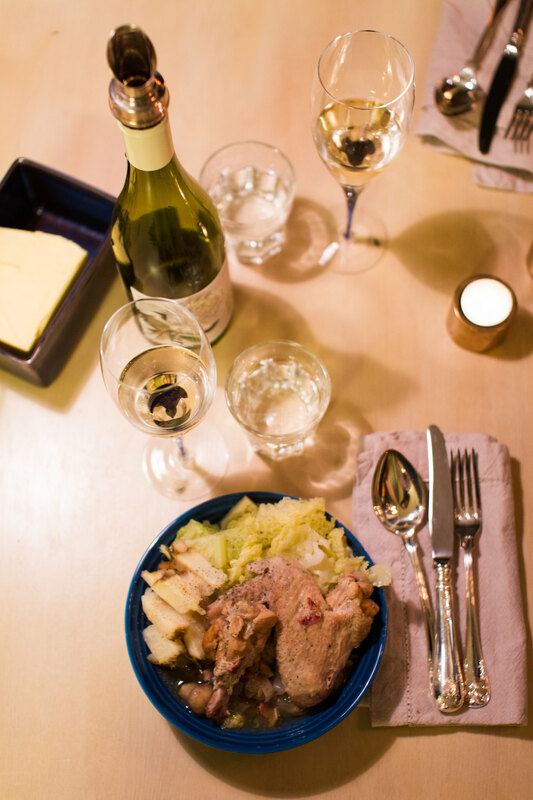 We had the coq au vin with some steamed savoy kale and root celery. A very nice dish that we’ll definitely will do more times. Make sure to enjoy the same wine to the dinner as used in the stew. 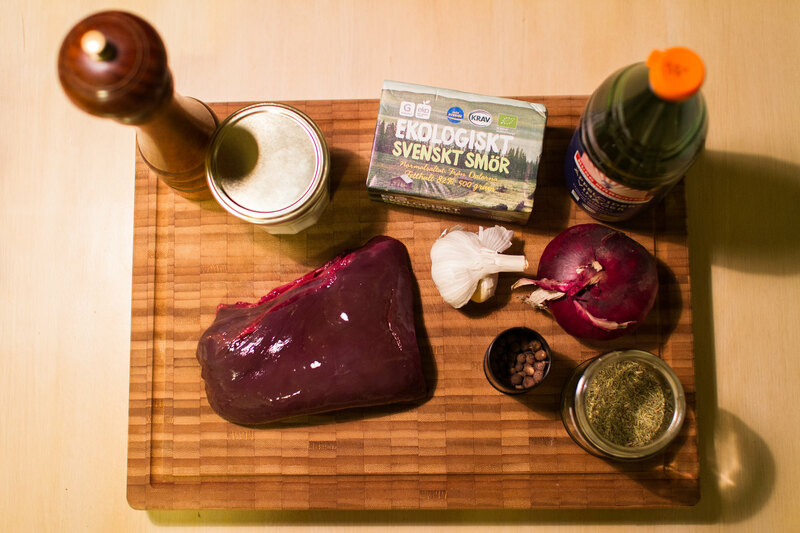 It is very nice to have a piece of venison liver in the freezer and turn it into a tasty pâté! The recipe that follows in this post is simple and quick and works with any kind of liver of course. Now in times of Christmas it’s extra nice with the touch of allspice in it. 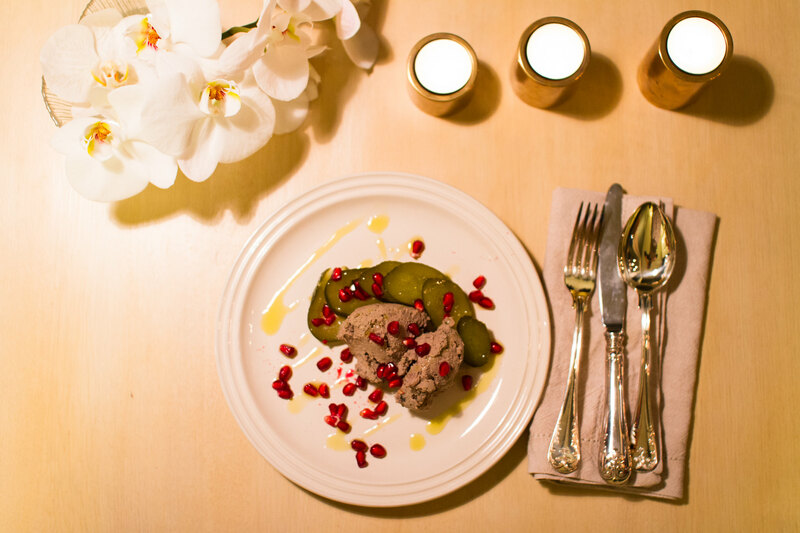 One way to serve the pâté is with some pickled cucumbers, pomegranate and oliveoil sprinkle. Luxurious! Chop the onion and fry it in coconut oil or lard until soft. Add the liver, chopped into smaller pieces. Add garlic, some allspice (grind first if it is whole seeds), rosemary, salt and pepper. Pour a small amount of apple cider vinegar in the saucepan and let it vaporize. 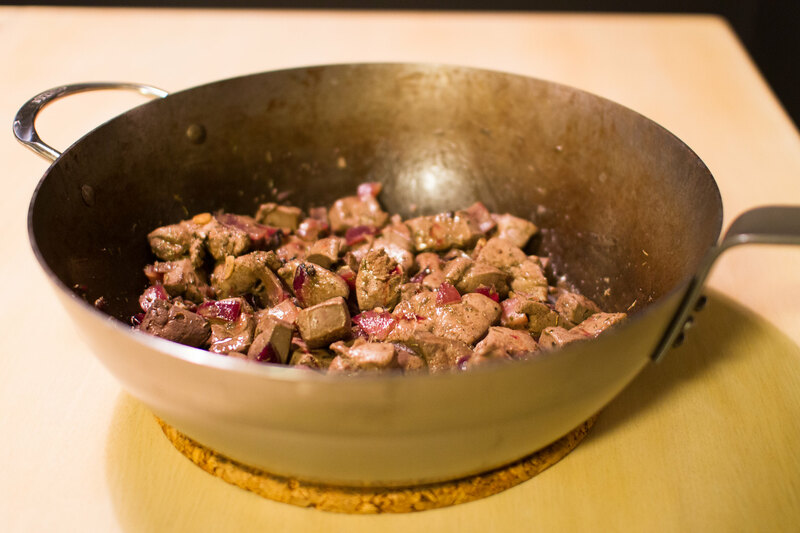 Place the liver mixture in a mixer with S-blade and add butter in chunks. 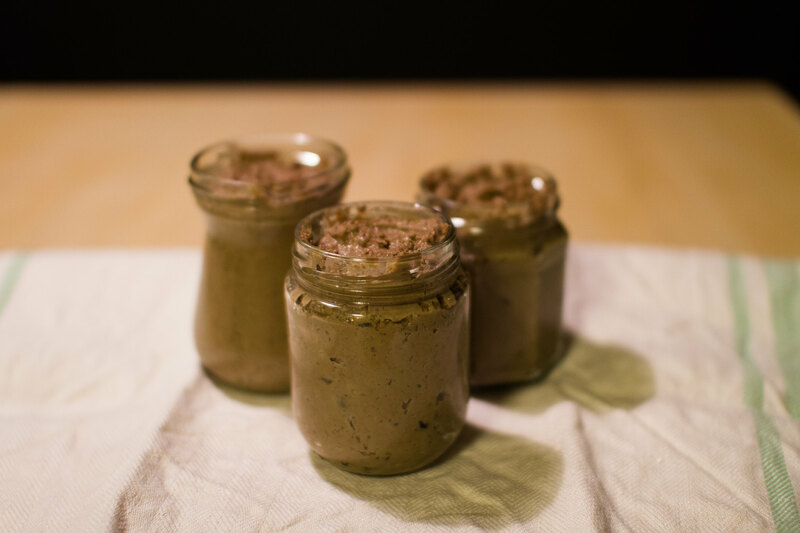 Put the liver pâté in glass jars and enjoy! It should be fine to have in the fridge for at least one week. We have had a red cabbage laying around in the kitchen for almost a week now, so it was high time to make use of it! It ended up being as a red cabbage salad. Red cabbage salad with lemon and lemon zest. The procedure was nothing fancy, using the food processor to shred the cabbage and grated the lemon zest off by hand. After salting the cabbage we massaged it and let it rest for a few minutes. The main ingredients, cabbage, lemon and olive oil. 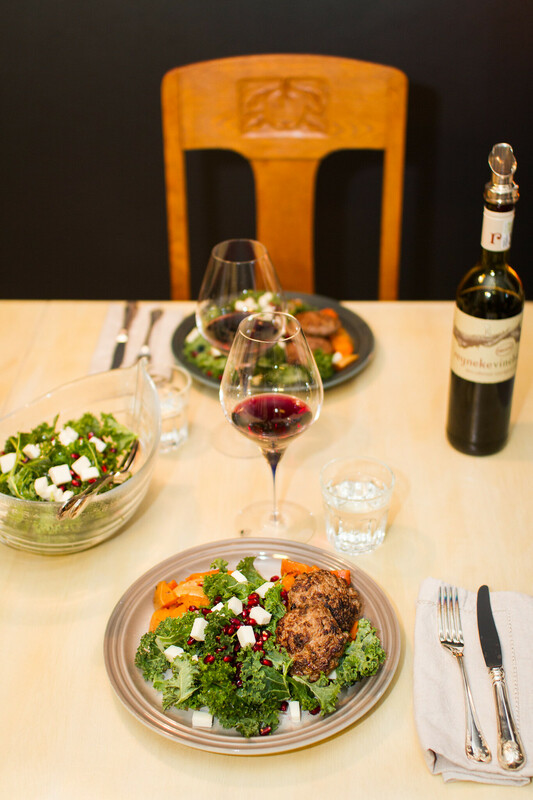 Together with the salad we had fried pieces of cow heart and oven roasted hokkaido pumpkin. The really nice thing about massaging the salt into the cabbage is that one can enjoy the salad the same evening. Using vinegar it is of course also possible to eat the salad the same day, but it is just not the same as if one leaves it until the day after. The lemon also made a really nice complement to the slightly bitter taste of this red cabbage. Dinner plate with the red cabbage salad, fried cow heart and hokkaido pumpkin. What is your favorite way of enjoying cabbage? Salad? Oven roasted? Steamed? Or some other way? Please let us know!